The Tarot Key explores the ancient wisdom of the Tarot. The cover features a classical painting of enlightenment, called the “Universum.” The book’s interior uses a large, screened-back (grayed) image on the left page of each entry, balanced by the smaller image on the right in black. Although the cost of manufacture required that the interior of the book be in black and white, the images provide the necessary detail for the reader. These images were taken from the public domain version of the Rider Waite Smith deck and processed through a special technique to render the original full color to black and white line art. Another nice detail in the design is the reversed number in the gray box on the right-hand side of the page, which provides a handy way to flip through the book and easily find your card by its number. 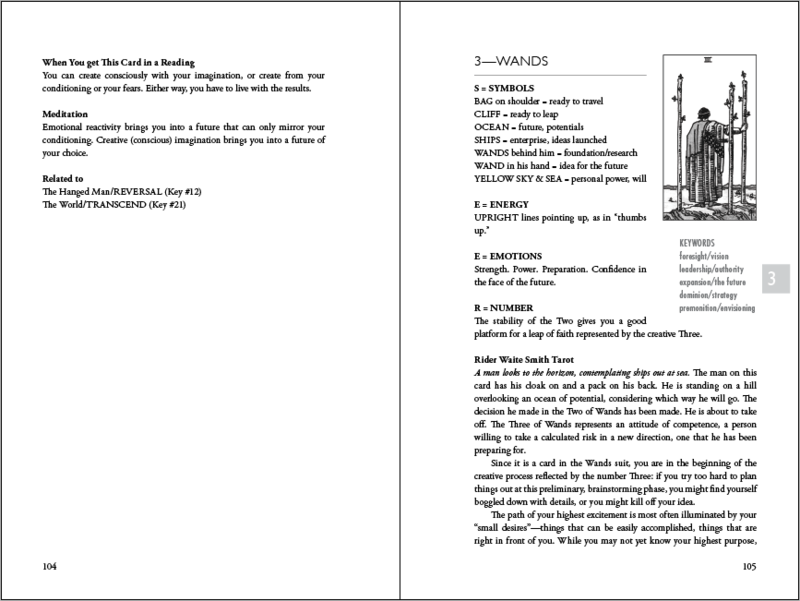 The book is designed so that all the numbers are in the same section; each number section starts with the Major Arcana card of the set. Therefore, to find the 3 of Wands, you would flip the pages to the number 3, The Empress, and go forward from there. Subsequent pages cover the meaning of the corresponding Magician card in the Tarot of Creativity. All the “one” cards are then explained, starting with the meaning of the Rider-Waite Smith tarot and then the meaning of the corresponding card in the Tarot of Creativity. The image is of a push-up toy that I bought in Chelsea a few years ago. Tension is conveyed by the jarring offset of the foreground and background colors. The 3D illustration was created by pouring sand over a painting of Venus by Sandro Botticelli. Then I created a swirl to reveal the lips. The “gangsta” theme of this book provoked a title made from a ransom note.